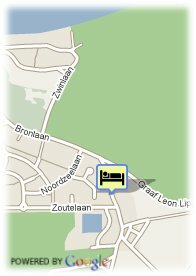 You are here: Home - Hotels in Knokke-Heist - Hotel St.-Pol. Bronlaan 23, 8300 Knokke-Heist, Belgium. 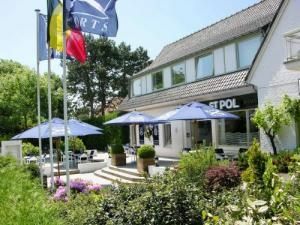 The lifestyle Hotel St. Pol in Knokke, a hotel with a rustic atmosphere, offers you a warm reception, excellent service and splendid comfort during your stay. A pleasant stay in the peaceful surroundings of the heart of "The Zoute" (Knokke) opposite to the butterfly garden. Everything is within walking distance of the hotel: a relaxing walk on the wide North sea beach of Knokke, a visit to the butterfly garden or a visit to the Zwin. For a night out, there are restaurants, bistros and bars in the nearby square "Oosthoekplein" only 200m from the hotel. The surroundings of Knokke are ideal for a walk or bike ride. The bike rental off the hotel provides you with the perfect bicycle for a calming ride along the coast or in the countryside. More than 14 days before arrival : no cancellation costs. Less than 14 days and more than 7 day(s) before arrival: 1 night will be charged. Less than 7 days and more than 1 day(s) before arrival: 2 nights will be charged. Children less than 12 years and more than 2 year(s) old: 25.00 € for each additional bed. Food & Beverage in Hotel St.-Pol. the hotel offers an extensive breakfast buffet from 08:15 –11:00. You can enjoy an English breakfast with eggs, sausage or bacon, ham, yoghurt, fruit juice, white cheese, croissants, butter, biscuit, bread and fresh fruit salad. At 100 meters from the hotel you can find splendid restaurants. Area information of Hotel St.-Pol. Numerous activities are available within walking distance of the hotel: a relaxing walk on the wide North sea beach of Knokke, a visit to the Butterfly Garden, relaxing at Siska's and or shopping at The Zoute. For a night out, there are nice restaurants, bistros and bars in the nearby Oosthoekplein Square closeby to the hotel. The surroundings of Knokke are ideal for a long or short walk and bike rides. Bikes are available for rent in the hotel, from here you can explore: The beach: 0,9 km, Forest: 0,2 km, Countryside: 0,1 km, Zwin Nature reserve: 1 km, Nature and country walks: 0,1 km, Bicycle routes: Start in front of the hotel, Lippenslaan: 2,5 km. This hotel offers budget rooms with flat-screen TV in Duinbergen, only 20 metres from the sandy beach.